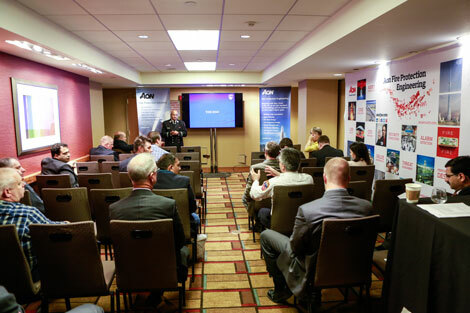 Aon’s Tall Building Risk, Fire, and Life Safety Host Room at the 2015 CTBUH New York Conference featured an agenda related to tall building development. 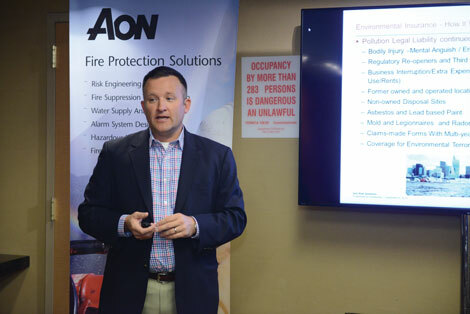 The program, led by Aon Fire Protection Engineering’s (Aon FPE) Chief Technical Officer, Daniel O’Connor, P.E., FSFPE, included presentations on tall building risk, life safety, fire protection engineering, security, and performance-based design. Aon’s unique program kicked off with Kathleen Almand, P.E., FSFPE, of the National Fire Protection Association, who presented “Emerging Issues for Fire Safety in Tall Buildings,” which discussed how NFPA and its research foundation are exploring emerging safety challenges and strategies to help ensure that codes and standards are not a barrier to the solution for today’s urban challenges. The release of the Guidelines for Developing Emergency Action Plans for All-Hazard Emergencies in High-Rise Office Buildings highlights the need to plan, prepare, and be able to manage various hazard scenarios. Chief Ronald Spadafora of the New York Fire Department (FDNY), and Laura Bennett, P.E., of SYSKA Hennessy, presented “Fire/Life Safety in High Rise Buildings,” which included the history of notable high-rise building fires; an overview of passive and active fire/life safety systems within high-rise buildings; history and updates to the NYC Building Code; and an overview from the FDNY on the World Trade Center (WTC) Building Code Task Force, detailing specific code updates for resilient high-rise buildings and Fire Department Operations. Chief Spadafora, part of the WTC Building Code Task Force, stressed that fire departments “like remote stairs” and “don’t like scissor stairs,” from a life safety and evacuation standpoint. Aon FPE’s Ervin Cui, P.E., Ph.D., explained the differences between the Chinese Building Code (CBC) and International Building Code (IBC) with respect to tall buildings, with the IBC containing more detailed occupancy requirements. He described his experience in code resolution, which involved working with Chinese Fire Departments on specific code issues to allow use of the IBC code instead of the less detailed CBC. Aon’s Max West discusses environmental insurance coverage. Ilana Judah, Int’l Assoc., AIA, OAQ, LEED AP BD+C, of FXFOWLE, and Fiona Cousins, P.E., CEng, LEED Fellow, of Arup, co-presented “Resilient Skyscraper as Refuge,” an in-depth look at urban centers experiencing the consequences of climate change and the social and economic impacts it could cause. They emphasized the importance of designing for multiple emergency scenarios (i.e. flood, fire, high winds, etc.) and prioritizing design approaches, such as adding more glass so the building stays warm if the power should go out. Max West of Aon Risk Solutions described the changing landscape of environmental insurance coverage, including a focus on vapor intrusion where contaminated groundwater and soil are evaluated, which can have significant impacts on properties. He highlighted emerging trends, including covering all factors of indoor air quality (i.e. mold, Asbestos, Legionnaires Disease, Radon, etc. ), environmental terrorism coverage, and lender environmental insurance. Captain Joe Evangelista of FDNY presented “Fire Safety and Emergency Action Plans for High-Rise Office Buildings,” which highlighted the importance of fire safety and emergency plans, including the need to communicate with local fire departments and provide them with copies of buildings’ electronic CAD floor plans, the Building Information Card (BIC), site plans, and a Riser Diagram. 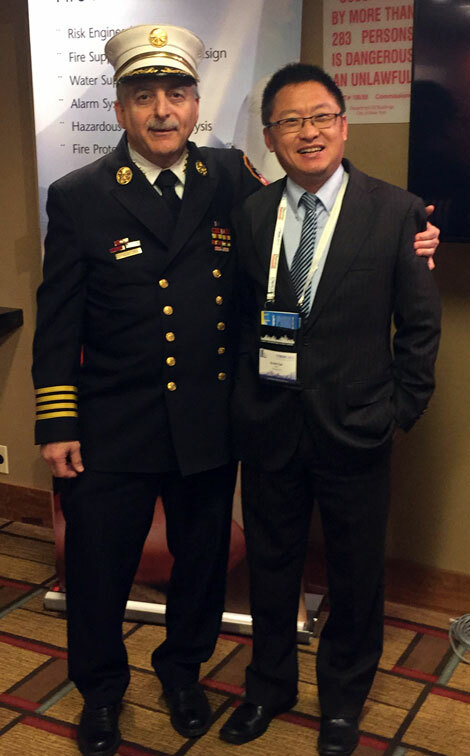 Chief Ronald Spadafora, FDNY, poses with Ervin Cui of Aon Fire Protection Engineering. Florian Block, Ph.D., of BuroHappold Engineering in Germany, presented “Structural Fire Design and Approval of a 156-Meter-Tall High-End Residential Building in Abu Dhabi.” He reviewed the project’s structural fire assessment involving numerous fire scenarios. The research, calculations, and performance-based design lead to an exoskeleton steel structure design around the perimeter of the building, which resists lateral loads induced by wind and seismic events only, while offering a pleasant, aesthetic feel. John Devlin, P.E., of Aon FPE, used a case study of Nakheel Tower to explain achieving code compliance in tall buildings using a risk-based approach. For the proposed 1,000-meter-tall building, a qualitative analysis was conducted of exit stair enclosure vs. elevators. Research determined that an evacuation strategy with a single exit stair yielded a lower risk than the same code complaint building with two exit stairs, and that enhancements to the elevator sub-system design were necessary to achieve the reliability outcome. Andrew Johnson of Arup presented “8 Chifley – Unique Sustainable Structural and Fire Engineering.” His team designed a unique exterior bracing joint that became a contrasting focal point of the building’s exterior, which expands and retracts with the building without affecting the structure. Cheol Lee, P.E., of Aon FPE, presented “Fire and Risk Related Features to be Provided in High-Rise Buildings,” focusing on fire and life safety, accessibility, security and anti-terror blasts, disaster prevention, construction, and business continuity. He emphasized the importance of safety-related features throughout all construction phases – including plan, design, construction, and operation – as a means to minimize risk, while protecting valuable lives and assets. Mark Peterson, an attorney with Aon Professional Services, discussed design professionals’ duties to third parties and their liability. His presentation included several cases. Sean Ahrens, CPP, BSCP, Security Practice Leader for Aon FPE, presented “Innovative Security Solutions for a Tall Building Campus.” His case study for the award-winning Qatar Petroleum District project illustrated how Crime Prevention Through Environmental Design (COPTD) was a critical part of the architecture, technology, and operations designed to minimize potential risks and threats to the facility. Tom Neudorfl of Murchie Consulting outlined designing operable façades for life safety and various risks, specifically wind. He explained the science behind wind factors and how variables (i.e. open doors, open windows) in a residential building can increase the life safety risk. Building serviceability issues may include noise, wall and ceiling damage, wall movement, ventilation failure, condensation, mold, and door slamming. Life safety risks are smoke control failure, exit stairs that fail to open, lift door jamming, and egress lift failure. John Devlin, Aon Fire Protection Engineering, Washington D.C.